What saved the Jews who sought refuge at Le Chambon, the humanist principles of the French Revolution, or religious conviction? I recently finished reading In Search of Deep Faith by Jim Belcher. This is a beautifully written book that weaves history, philosophy, and theology into a story of pilgrimage. In Search of Deep Faith tells the story of several well known heroes – C.S. Lewis, William Wilberforce, Dietrich Boenhoefer. One of the best chapters, however, was about André Trocmé, someone who I previously knew nothing about. Trocmé was the pastor of a church in Le Chambon, a remote village in southern France, who lived during World War II. As the war progressed and it became clear the France would fall Trocmé addressed his congregation: “Tremendous pressure will be put on us to submit passively to totalitarian ideology… the duty of Christians is to use weapons of the Spirit to resist violence that will be brought to bear on [our] consciences.” Trocmé knew that evil was coming, and that evil would need to be resisted. When the occupation of northern France began and French Jews started being sent out to concentration camps Trocmé looked for a way to help. First, he offered to go into to the concentration camps himself. 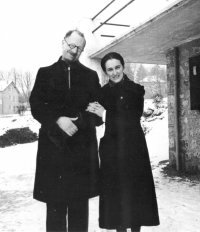 Since there were already several others engaged in that ministry he was encouraged to offer his town as a refuge for Jews fleeing persecution. Because of its remoteness, Le Chambon was an ideal destination. Additionally, this was a dangerous job and most towns feared harboring Jews. Trocmé, his church, and the other churches of Le Chambon agreed to provide this refuge and it didn’t take long for them to start bringing in refugees. Somehow, the entire town was either in on the conspiracy or remained silent. This community solidarity was essential to their safety. The task was dangerous from the start but the danger escalated when Georges Lamirand, the secretary-general in charge of youth affairs, visited the town. Lamirand was trying to find out why the youth of Le Chambon weren’t join the Nazi-friendly youth movement. As Lamirand was leaving some of the youth from the local school hand delivered a defiant to Lamirand, admitting that they were harboring Jews and swearing to fight attempts to capture the refugees. It didn’t take long for Vichy France to respond. They regularly raided Le Chambon in search of Jews. But Le Chambon was aided by an insider who gave them advanced warning. Despite the constant threats, including a hit put out on Trocmé, the town remained defiant and became one of the most important stops for Jews seeking refuge in all of France saving between 3,000 and 5,000 Jews from death in concentration camps. In 2004 French President Jacques Chirac visited the town and recognized the heroism of the town. In his speech Chirac said that the people of Le Chambon “chose the humanist principles that unite our national community and serve as the basis of our collective destiny.” What motivated the people of Le Chambon, according to Chirac, were the principles of Liberty, Equity, and Fraternity, the slogan placed on all the public buildings of France. Pierre Sauvage, a Jew whose parents were saved because of La Chambon, and who produced the documentary Weapons of the Spirit asked in an editorial, “Had the people of Le Chambon not been motivated to resist the Holocaust by more than mere Frenchness?” Indeed there had been something more, something Chirac could never admit. Trocmé, and the others of La Chambon were driven by deep religious conviction. They loved those who were different from them because they saw them as people created in the image of God. They sacrificed at great cost to themselves because they knew the commands of God, the Ten Commandments, the law of the “cities of refuge” in the Old Testament, and the story of the Good Samaritan. They were willing to suffer loss because they understood the gospel – the life, death, and resurrection of Jesus. They confronted wicked authority because they knew they served a higher authority. They chose not to fear man, because they feared God. It wasn’t Chirac’s humanism that resisted the Nazi’s. It was conviction for the gospel. They understood that gospel produces true liberty, equity, and fraternity and that it’s the Word of God breaking down barriers that creates courageous and loving communities. This entry was posted in Book Review and tagged Andre Trocme, books, Christianity, Ethics, In Search of Deep Faith, Jim Belcher, Le Chambon, World War 2 on January 29, 2014 by stevenkopp. Thank you for this post. It delightfully surprised me. I’m not usually a fan of reading book reviews. 🙂 The closing quote will continue to dominate my thought life for the next few days. Thanks Kristen, I’m glad you enjoyed it. That’s just one of many excellent quotes in the book.